One of Burning Nights CRPS Support followers and supporters; Robert Hunt, will be undertaking 5 half marathons for CRPS. Robert's partner lives with Complex Regional Pain Syndrome and therefore has chosen to support Burning Nights CRPS Support charity because of his partner. 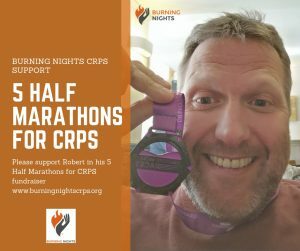 Support Robert in his 5 Half Marathons For CRPS fundraiser in aid of Burning Nights CRPS Support Robert will be taking on 5 half marathons in March. May. August, September and October. Please support him in any way you can either by making a small donation, by cheering him on at the marathons or by sharing his fundraising page. Wishing Robert all the very best and Good Luck for all 5 of the half marathons for CRPS!